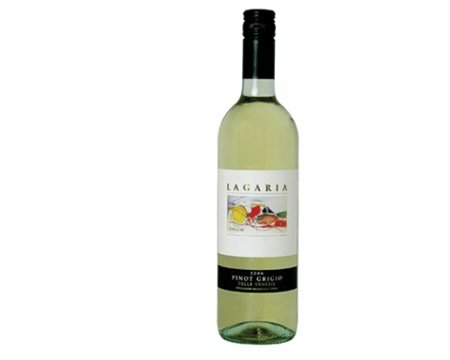 Today we look at a pinot grigio from Italy that costs $9 a bottle. Bottom line: Love it! An affordable and very drinkable pinot grigio. Why is it so good? As we have said, pinot grigio is often so light and clean that it barely tastes like anything. Well, Lagaria has some real flavors — zippy lime and other citrus flavors with some pleasant mineral inflections on the finish, as one short online review said. BUT, it’s still light and clean (UNlike the dreaded Estancia pinot grigio, which is packed with many flavors and ends up tasting heavy, confused and weird.) By the way, I hereby pledge never to use the word “inflections” in a review again. Lagaria is fruity, and tangy. It tastes like real pinot grigio. It has a nice, coherent feel in your mouth that speaks with one voice, and it stays interesting while being refreshing. It’s easy to drink (I’m reminded of the Coneheads beeping out the words, “mass quantities”). And finally, it’s a little bit on the sweet side for a pinot grigio, but it’s not too sweet. This one’s a crowd pleaser. Highly recommended.